Cor has over 30 years experience working in Participatory Forest Management. He has worked as an agricultural extension coordinator in Kenya, as lecturer and researcher in socio-economic aspects of forest management and policy in Wageningen Agricultural University, as rural sociologist in an FAO regional wood energy development program in Asia, as coordinator of the FAO-RECOFTC Forest, Trees and People Network in Asia and as head of the collaborative community forestry programs in RECOFTC. Since late 2004 he has worked as a free lance consultant on more than 20 assignments in planning, training, and evaluation of participatory natural resource management programs and projects. Main clients have included FAO, RECOFTC, SDC, The World Bank, Danida, IDRC, and Ford Foundation. 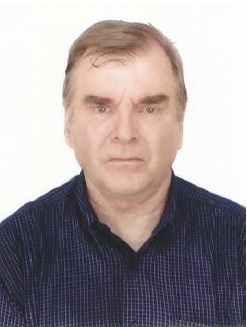 He also acts as the Representative of MDF Training and Consultancy in Thailand. MSc (Ir) Rural Sociology – Wageningen Agricultural University, The Netherlands. 1972 to 1978. Diploma (Ing) - Dordrecht Agricultural College. 1966-1969. Participatory workshop design and facilitation/ facilitating project programme planning and review processes. Bangladesh, Bhutan, Cambodia, Pakistan, Philippines, Laos, Myanmar, Indonesia, Thailand, Vietnam, India, China, Kenya, Nepal, Netherlands, Spain, France. What clients say about Cor Veer? ''Thank you very much for your excellent work. 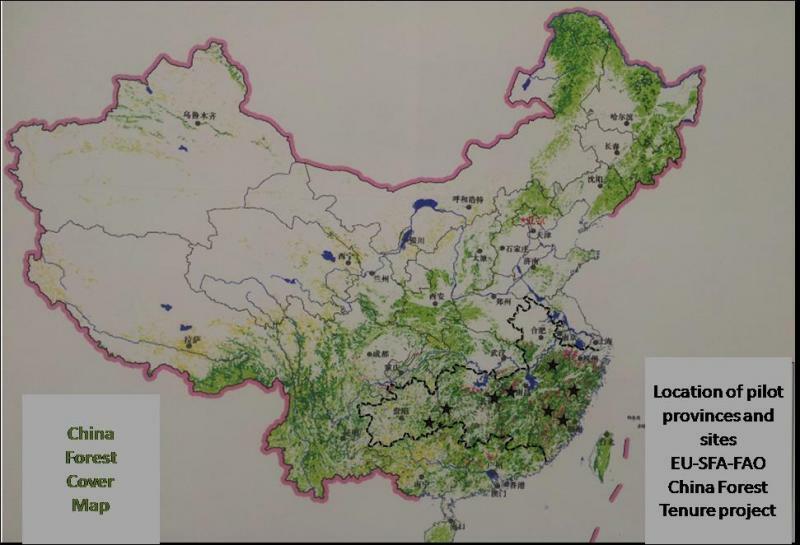 (…) I think the guide should be applied not only in SE China but also in all collective forest areas of China''. (Dr. Jiang, Chunqian, FAO project coordinator, China, commenting on the PFM guides). What has Cor been working on recently? Early 2012, Cor completed work on the FAO-RECOFTC draft training guide for facilitators of forest tenure reform processes. 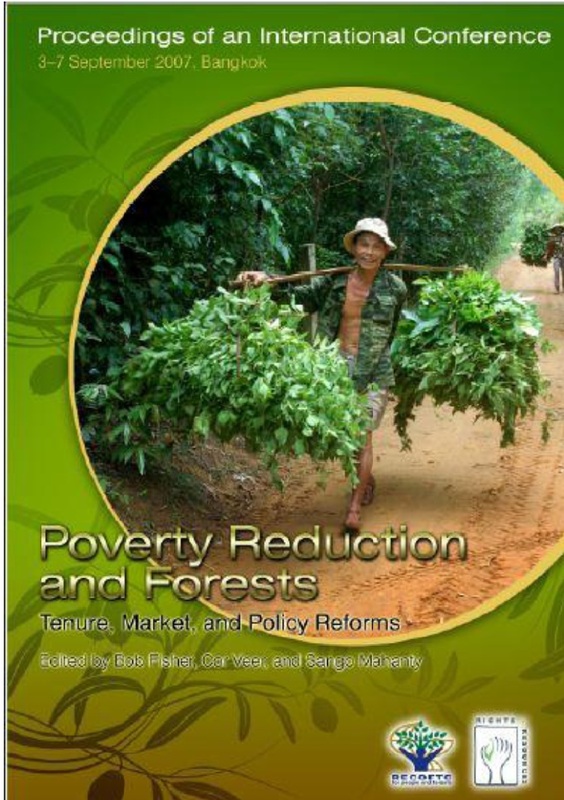 The reform process principles proposed in the FAO Forestry Paper 165 Reforming forest tenure. Issues, principles and process, were the basis for the development of the training materials. 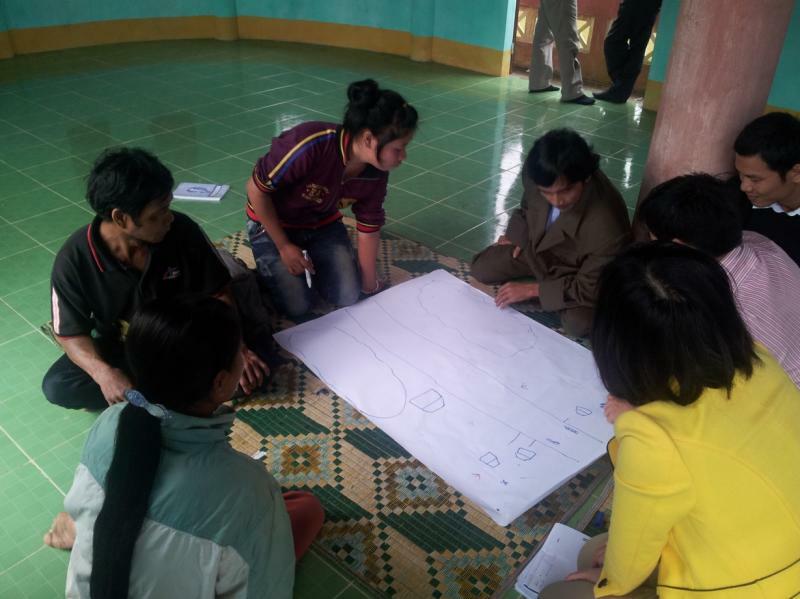 The materials were tested in a pilot training in Vietnam, with participants from national and provincial level actively involved in forest tenure reform. Based on the lessons from the pilot training, the ‘training module for tenure process facilitators’ was re-written. The module comprises 7 sub-modules as summarized in Fig below. FAO will use the module for further field testing and adaptation in Africa. 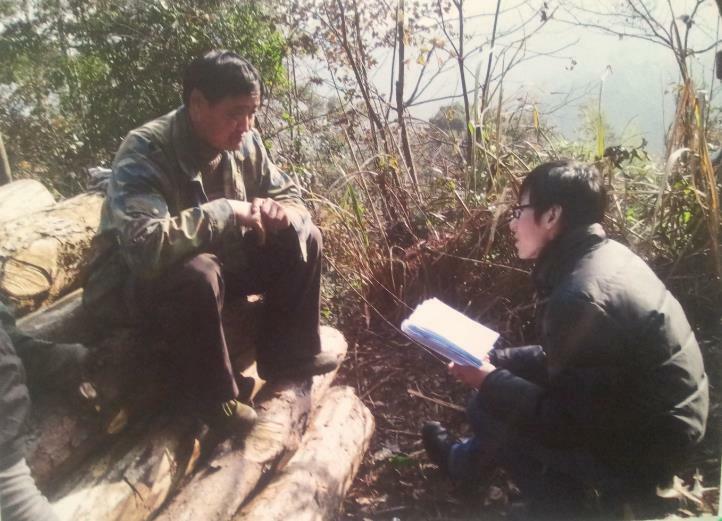 From July to September 2012, Cor worked for the EC-SFA-FAO project on Forest tenure in China, to prepare a synthesis paper of the results of pilot applications of training materials and research in participatory forest management (PFM) carried out in 6 provinces in South East China. 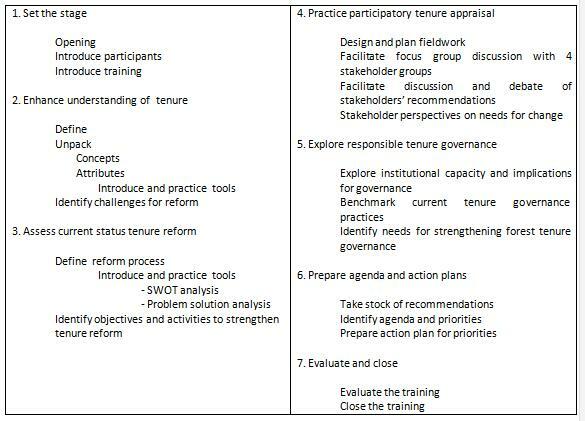 The lessons from the research formed the basis for the preparation of a guide for the strengthening of collective forest management, as well as a policy brief for collective forest tenure reform. In addition a synthesis report of the assessment of the operations of ‘forest tenure trade centers’ was prepared. The findings from the PFM assessments indicated that the greatest needs for strengthening the management of the collective forests by the newly empowered owners, were in the alleviation of ‘old’ policy restrictions as well as the provision of a wide range of advisory (forestry extension) services. The policy brief points at the need to replace the restrictions related to forest protection and harvest control through policy instruments that are more in line with the new situation that has emerged after the tenure reform. New policy instruments to be developed include voluntary guidelines for sustainable forest management and the development of an effective forestry extension service. The guide for strengthening collective forest management provides a framework for assessment and strengthening of forestry extension in collective forest areas. In October and November, Cor worked with RECOFTC in assisting the UNCCD in the preparation of reports on the implementation of regional and sub-regional action programs to combat desertification and land degradation in Asia. These reports form the basis for the review and planning of the implementation of the UN convention on combating desertification and land degradation to be held in early 2013. Figure: Interview during assessment of forest tenure trade centres. More examples of Cor's recent track record.